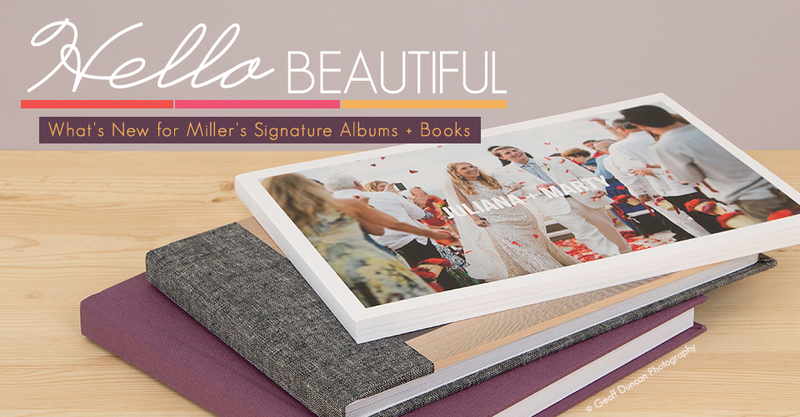 We are pleased to introduce many new additions to the Miller’s Signature Album + Book line. Thanks to your fabulous feedback and our skilled makers, we are once again improving upon our most talked about keepsakes. 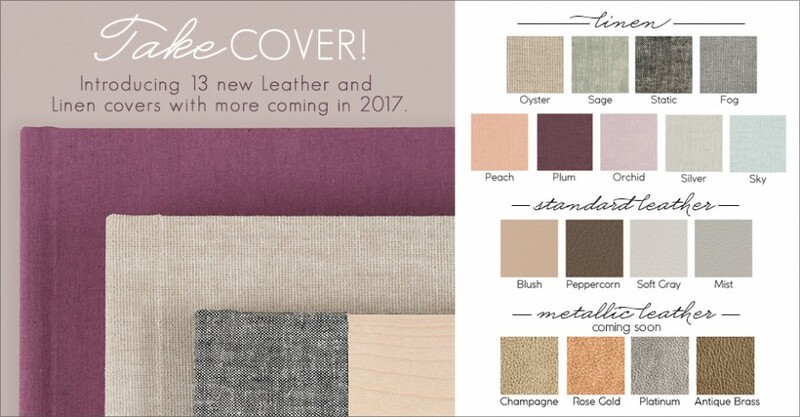 In celebration of the new year, we have added 13 new Leather and Linen covers for Miller’s Signature Albums including scrumptious options like Peach Linen, Static Linen and Blush Standard Leather. And that’s just the beginning – you can now pair Linens with Acrylic, Metal and Wood covers to create stylish combinations. Be sure to download our new Custom Cover Guides and keep an eye out for Metallic Leathers coming in early 2017. We are giving you the flexibility to create Albums + Books to your desired page count without the limitations of five spread increments. You want an 11 page Miller’s Signature Album? Done. How about a 27 page Miller’s Signature Book? Easy-peasy. To see how this affects pricing, click here. You asked for a Softcover Miller’s Signature Book, so we put our heads together and made it happen. 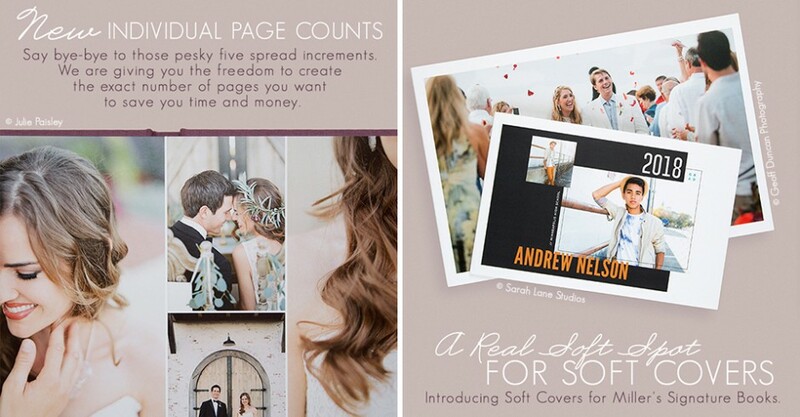 Offer your clients a tasteful and modern book to remember their biggest and brightest moments. Plus, it comes at a friendlier cost to you. Beyond excited for the news!!! Keeping rocking it Millers Crew!!! Hi Leila, we discontinued a few of our cover options that weren’t selling. We will continue to add new options though, your feedback is greatly appreciated! Thanks so much! I did love the red, but can see how it might not have been a great seller. I’m very excited about the other changes and am excited to see the new cover choices! Thanks, Millers! LOVE the new looks!!!! When will the new Metallic Leathers be available? Hi Jenny, we are still working on it but hoping they will be ready by end of February. You have no idea how excited I am about this. I have been searching for an album vendor and loved your albums but the linen cover choices were just too bright colored for me. These colors fit my branding PERFECTLY. They are literally exactly what I’ve been looking for. Would love to see a photograph of the spine view of a Softcover Signature Book. Hard to visualize how it would look and feel. Yes, these options are live now. I am ordering an album now and noticed that the type e surface is now $22 more on a 30 page album, but metallic is less. Is this correct? And if they get the metallic, can’t use the Lustre coating? Also noticed the price on the thick pages went up. Excited for the metallic leathers! Any ETA on how soon those will be available? In love with the new leathers and the switch to adding individual pages. Hello Dixie, we will be offering swatches for purchase very soon. Hi Nola, there were some price adjustment but E-Surface and Metallic should be the same cost. Thank you for the feedback, Susan. Yay, that’s so wonderful to hear Erica! Hi Riana, that option is only available for the Albums at this point in time. Thank you for reaching out to us. I was praying for this, yeah!!!!!!!!!!!!!!!!!!!! Hi Susan, we are still working on this! Eek definite price hike for the albums I sell! Glad I can finally order the samples kit… love the new options. In the email sent out today it says that the layflat album is going to be discontinued. Whaaaattt???! What will the albums now look like? Hi Kristin, we recommend checking out the Miller’s Signature Album and Miller’s Signature Book lines in replacement of the LayFlat Album. Let us know if you have any questions that we can help out as you make your transition. I noticed an email that said you’re no longer offering layflat albums. What does this mean exactly? You will not be offering the pages that lay completely flat? I hope that isn’t what it means, but I’m hoping there’s something I’m not understanding right!!! Thank you! I love the new colors and i know my clients will too. I know some will be disappointed by the disappearance of the bright colors too. Atmosphere is a favorite. Bring back the red leather too! PLEASE! Ordering an album and wanted thick pages. This is no longer an option? Hello Catherine, thick pages is still an option for Miller’s Signature Albums. Make sure you haven’t accidentally selected the Miller’s Signature Book or email into Customer Service for additional help. When will the metallic swatch kits be available? Love the new colors, but Diamond was my best seller in the distressed leathers. A bit bummed. Are the current Signature Album swatches up to date with the newest covers? I have never ordered any previous swatches. Was wondering which swatches to order and not be redundant. Thank you. The swatches available now are completely up to date. Hi Paige, Metallic Leather swatches are now available. If I order swatch boxes, they have the new swatches in them, correct? I’d hate to spend more $$ on boxes I already have with the outdated swatches. HI! So these are only for albums? Will there ever be new colors available for the books? They are pretty limited, but would sell well if I had more options. Thanks! Hi Chime, these new color options are only available for Albums at this time. We appreciate your feedback and we will definitely look into adding more options for our book line! Thank you SO much for getting rid of the 5 page spread add ons. That was such a nightmare to describe to clients. Now we can charge per image! Pls have a pink sometime soon! Would be great if you could offer inside back cover foil stamping for the Signature Books like you do for Signature Albums. I use that to include my studio name, as you don’t offer die stamping. With the books, I have to remember to design it into the spreads, and it isn’t as professional looking. Thanks for the feedback, Johanna! We got our cover samples today and I was surprised to not see more blue covers in leather or linen. Also, are there instructions on Designer Plus masks? Would like to add custom masks but I’m not clear on the required file format. Hi Peter, if you contact us at info@millerslab.com we will be able to provide further instruction. This is such great news! Can I leave a possible suggestion perhaps? I love Miller’s quick turn around time and great quality, but my couples would like more options for font choices for blind and foil (similar to Red Tree Albums offerings). I think if you offered this addition, it would be a game changer. Fingers are crossed! We appreciate the feedback, Stacey!